How Brave Combat Federation, and its upcoming International Combat Week, are increasing the international awareness on the Kingdom of Bahrain. And here everybody knows Brave as the ‘Bahrain Prince’s promotion’, that’s how it goes. With eight events promoted in six different countries — Bahrain, Brazil, United Arab Emirates, India, Kazakhstan, and Mexico –, Brave CF completed an unprecedented world tour for a Mixed Martial Arts promotion in its first year. It reached 84 countries and more than 800 million households on TV, as well as hundreds of media, specialized or not in Mixed Martial Arts, around the globe. These achievements, of course, not only made it a national project in Bahrain but increased the awareness about the Kingdom of Bahrain worldwide. The reason is simple, according to Mohammad Shahid, president of Brave Combat Federation. “Differently than any other major event we have ever had in Bahrain, Brave CF is local. So it doesn’t matter if we have a Brazilian, an American, a British, or someone from any of the 32 nationalities we’ve already had represented inside the cage, it’ll always be the Bahraini flag raised at the end of the day”, he stated. In fact, it can go even beyond that, as says Sweden’s Erik Carlsson, a professional fighter competing under Brave CF banner. “Honestly, I have to admit, I didn’t know about Bahrain before. I had heard the name here and there, for reasons that I can’t recall but that’s it. When I signed my contract, I learned so much and ended up visiting the country for my debut fight at Brave 2, last December”. “And there’s more”, he continued. “Not only me but my circle of friends and relatives, people from my gym, my fans… I mean, a lot of people not only in Gothenburg but in Sweden and Scandinavia got to know and learned a lot about Bahrain after I joined Brave”. Moving further West the impact is even bigger, as points out Henrique Rasputin, who fights out of São Paulo, Brazil. “The truth is when you talk about the Middle East people in Brazil can only think about Dubai. That’s all they know. And I kinda took that as one of my goals: ‘You know what? I’m gonna spread the word about Bahrain’. And I do that for all they’re doing for the fighters and for the sport”. “On top of that, Brave became something huge in Brazil”, Rasputin added. “We were in a transition moment in the Brazilian MMA scene, without anything to look up for. Even UFC, which at some point was having monthly events here, is reducing their presence in the country. On the other hand, Brave expanded, invested in the country, and in the athletes. Of course, people will acknowledge and appreciate that. It’s natural. And here everybody knows Brave as the ‘Bahrain Prince’s promotion’, that’s how it goes”. 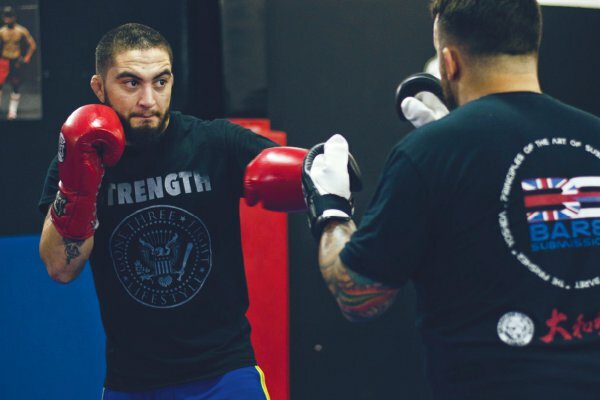 Bahrain’s most prominent MMA fighter, the local star Hamza Kooheji also embraced the cause and guarantees: his case is the perfect exhibit of Brave CF’s magnitude. From 12 to 19 of November, Brave CF will be back home with Brave International Combat Week, a series of events taking place around Bahrain and promoting its culture and the vocation to be a sports hub in the region. The program is headlined by Brave 9: The Kingdom of Champions, on November 17, at the Khalifa Sports City, in Isa Town. The fight card will be the biggest one ever promoted, with three title fights and fighters from 21 different countries. United Kingdom’s Charlie Leary, a three-time local champion in his home country, spoke about the excitement of getting the call to compete at Brave 9 and coming to Bahrain for the first time. For USA’s Alex Trinidad, in turn, sees his Brave CF debut, also scheduled for Brave 9, as a homecoming. The US Navy veteran served in the Kingdom of Bahrain during his days in the force and couldn’t be happier for the chance of visiting the country again.